The Guardian Newspaper has just published online a collection of “Untold Stories of the War” referring to World War One. These short stories are told by twelve familiar British authors: Jeremy Paxman – HMS Audacious sunk on 27 October 1914 yet spent the whole war on the official complement of the Royal Navy throughout the war; Michael Morpurgo – who after talking with two old veterans decided to write about the war from the perspective of a horse, creating the book War Horse, later turned into a popular movie; Sebastian Faulks – the horrors seen by the soldiers; Margaret MacMillan – Britain declaring war in the “proper manner” , Richard Curtis – discusses the comedy in the War leading to the writing of the sitcom Blackadder Goes Forth and the power of the final minutes of the sitcom; Terry Pratchett – How the soldiers became known as “Tommies”; Pat Barker – the humanizing of the wounded soldiers in the pastels of Henry Tonks a surgeon and illustrator; Richard J. Evans – the surrender of German officer in New Guinea after the end of the war; Max Hastings – the bloodiest day of the war – 22 August 1914 when the French lost 27,000, the bloodiest day for the British was the 1 July 1916 with 20,000 fatalities; Antony Beevor – tells of the divided views of how historian’s view the war, but ends with the personal diary entry of his grandfather-in-law winning the DSO; Douglas Newton – discusses the behind the scenes maneuvering by British politicians that led to its commitment to war; and Helen Dunmore – explains a game of Bomb Ball to be found in an official pamphlet on games, which is in reality an understanding of the rules for handling grenades. This is a long piece by newspaper standards but worth reading for the fascinating vignettes told about the war. I want to thank John Reid who brought this to my attention in his blog – Anglo-Celtic Connections. Tracing Your Army Ancestors: A Guide for Family Historians. Second Edition. By Simon Fowler. Published by Pen & Sword Family History, 47 Church Street, Barnsley, South Yorkshire S70 2AS, UK www.pen-and-sword.co.uk. US Distributor: CasemateAthena 908 Darby Road, Havertown PA 19083. www.casemateathena.com. $24.95. Australian Distributor: Gould Genealogy & History, P.O. Box 119, St. Agnes SA 5097. www.gould.com.au. AUS$34.95. 2013. x, 192 pp. Illustrations, index. Softcover. British Army research is a vast subject. This book breaks it down into manageable pieces. But how one does research depends upon the time period, rank, service specialty and the specific war. So the book’s chapters cover: organization of the army in the eighteenth and nineteenth centuries; the army before 1660; officers; other ranks – enlistment and conditions of service; medals; casualty rolls; discipline and desertion; pension records; militia 1757-1914; women; British in India; dominion and colonial forces; Boer War; First World War; Second World War; 1919-1969. Appendices address: army service numbers; problem solving; TNA research guides; and army ranks. Each chapter begins by providing historical and social context for the subject under discussion. This is followed by detailed guidance on the records, what they contain, how to access them and how to interpret what is found. Most subjects include bibliographies for additional reading. The chapters are well illustrated especially in terms of sample documents. It should be noted that although there is a growing body of military records available online, it is highly unlikely that it will ever all be online. Many original records will need to be accessed in person, or through hiring another researcher, at The National Archives in Kew. 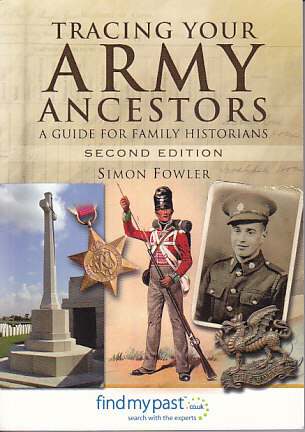 I have read and used numerous how-to-books over the last 30 years for tracing my military ancestors and can heartily recommend this one. With any good book on the subject there will be a mental interaction with the book saying “I need to try that” or “I need to check out that source”. As you do research you find more about your ancestors, and you learn more. You are in a constantly changing place, and hopefully you have tried the obvious, but maybe you haven’t because more records are coming online all the time. Reading a book such as this will give you additional clues, indexes, sources that need to be checked out making it a book worth reading again and again as you make progress. I know I marked numerous record groups, indexes and published sources that I need to examine for my growing number of army relatives. Naval and Military Press has just released a Special Great War Catalog with over 400 titles in this one publication. It provides a full range of Divisional Histories all at 50% off. There are numerous Regimental and Official Histories, contemporary memoirs and more. Some of the databases sold can be found online at some of the commercial websites so be careful. But this is a goldmine for readers wanting to know that a particular book even exists, or for those wanting to fill in the gaps in their personal library, or wanting to know more about the regiment or division in which their ancestor served, or learn specifics about the battles in which they served or died. If you have an interest in World War One do download a pdf of the catalog, linked here. One of the benefits of downloading the pdf, or opposed to getting the newsprint version of the catalog which I was also sent, is that you can search it for any regiment, division, battle or word which is very handy in this packed catalog.